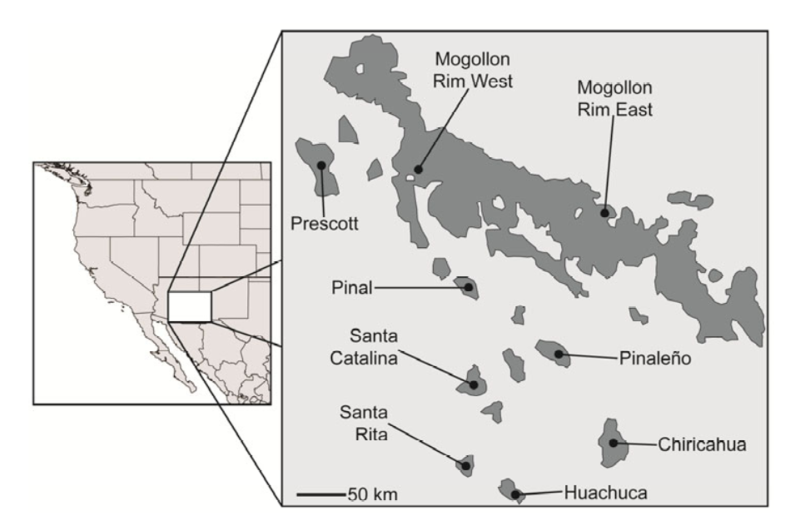 Isolation by environment, not distance, explains the genetic relationship between an avian taxon among Madrean Sky Islands, according to a new study appearing in Molecular Ecology by Manthey and Moyle. The authors throw the kitchen sink of new analyses at a combination of geographic, ecological, and genomic data and provide an interesting example of isolation by environment in a widespread species within a strongly heterogeneous landscape. This new paper is significant in a couple ways. First, this is one of the first investigations of isolation by environment that utilizes hundreds of SNP loci, opening the door for the detection of adaptive loci that may relate to environmental distances. Second, the geographic scope of this taxon is unique since you may not expect a highly mobile bird to show such variation across a relatively small geographic scale. If you are out there looking for a blueprint for the future of IBE studies, Manthey and Moyle have kindly provided a preview of the type of papers you are going to be reading quite often over the next few years. This entry was posted in adaptation, Molecular Ecology, the journal, phylogeography and tagged Birds, isolation by distance, isolation by environment. Bookmark the permalink.